Okay, so yesterday morning I had a mockup and nothing else. I hadn't even finished tracing the pattern with all the changes from the mockup. All I have left to do is cut down a couple of the bones, make the bias binding, and finish the edges! I decided, after I did that, that I didn't want yet another layer for a lining. It was going to be heavy and hot as it is, despite being made of all cotton. While the coutil is a bit rough, it's not meant to go against my skin (except at the shoulders) so I think it will be fine. 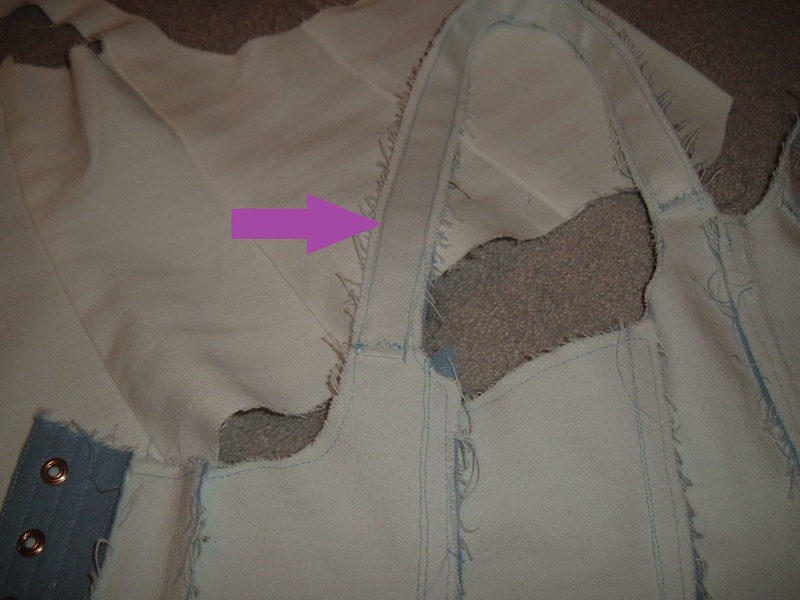 Speaking of coutil, I should mention that all I have, and thus what I made the bodice out of, is domestic coutil. I have it because it was far less expensive than the imported coutil you can buy at Farthingales, and I've learned you get what you pay for. I got the opportunity to work with the Farthingales coutil at the Creativ Festival, and it's 100% non-stretch, it has an exceptionally tiny and dense weave, very thin, light, and exceptionally strong. The stuff I have is thick, the weave is loose and the pattern is 10 times larger. It has some stretch, and I honestly don't really like working with it. I was really put off by the $30/m pricetag at Farthingales way back when I wanted to buy coutil, but I think I may have to bite the bullet and get myself 2 or 3 metres. It's 60 inches wide, and will make a few corsets. I put in the grommets at the start of the process, and I put one in backwards. I've been told this is a permanent, unfixable thing, once you've set a grommet the wrong way round. Well, that may be, but I was not going to let one grommet be backward after all that work. So I took my awl and unpinned the spread-out grommet, then started the finicky and damaging work of getting it back out of the fabric. I don't cut holes, I spread them with the awl, so unfortunately this was impossible to do without damaging and breaking a lot of the threads. I have now learned to double-check the grommet before I pound it in. The burned hand teaches best, of course. Except in my case, it's the stabbed and maimed hand. It is very hard to unpick a spread-out grommet with an awl and the damn thing slipped a couple of times and embedded itself in my thumb. Stabbing yourself with a pin or needle is something we all get used to. An awl hurts. Once I'm done with the bodice I'll have to immediately start on the skirt and apron. I cherish hopes that these basic items will not take me nearly as much time and pain as the bodice. For the moment I won't be doing anything with the pink, but I'll probably eventually do a gathered overskirt. The burgundy will be the skirt and the white will be an apron. It's got a very visible linen texture that I think will look really neat. I plan to put a pocket in behind the apron. I may yet do a bodice out of whatever's left of the burgundy. We'll see.